I can't believe this series is now over! I'm going to miss the Merrick brothers so much. 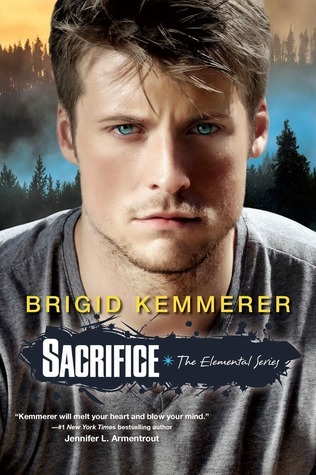 Sacrifice was a gripping, fast-paced ending that totally gave me all the feels. Brigid Kemmerer has done it again! Michael is my favorite character besides Gabriel, and this book just made me fall in love with him even more. He's hardworking and cares for his brothers so deeply - as the title suggests, he's willing to sacrifice literally anything for them. My heart broke for him in this book because so much crap happens and Michael is at a loss as to how to protect his family. It's interesting yet fitting to see the way Michael views his brothers, because they come across as much younger than they did in the previous books. Hannah, Michael's girlfriend and the other narrator in this book, was also a well-developed character. She'd only appeared briefly in the other books, so I was excited that we finally get to learn more about her. She's a strong character, but...well, let's just say she doesn't handle stress as well as Michael. I liked her, but didn't love her - she threw tantrums and argued so much instead of just acting her age. I will say I adored the way the tense relationship between Hannah and her father played out, though. Very well-done. The plot was action-packed, as always - lots of fires and explosions! Kemmerer packs a lot into a fairly short book (and for anyone wondering, the actual book is less than 300 pages - the Kindle and paperback versions are longer because there's previews of the other books/novellas). I was always on the edge of my seat wondering what would happen to poor Michael next, and I liked the way a couple subplots were intertwined. My only quibble about this book is that it's almost too much crammed into too short an amount of time. I believe the whole book only covers the span of a week, and I felt like it should take place over a longer period of time. But aside from that and Hannah's sometimes immature attitude, I quite enjoyed Sacrifice. It's a wonderful, heartfelt conclusion to the Elemental series, and I'm going to miss the Merrick brothers more than words can say. It goes without saying that I'm picking up Brigid Kemmerer's next book the instant it hits shelves!